Developing a modern data archiving strategy isn’t easy. IT departments are plagued by data growth and legal and compliance teams struggle with how to best retain, discover, and supervise content. -Stay compliant with industry rules and regulations through Enterprise Archiving, Intelligent Supervision, E-discovery and Analytics and Social Media Compliance. In today's shifting threat landscape, cyber criminals increasingly target individuals rather than infrastructure. How can you defend against highly targeted and effective attacks like phishing? 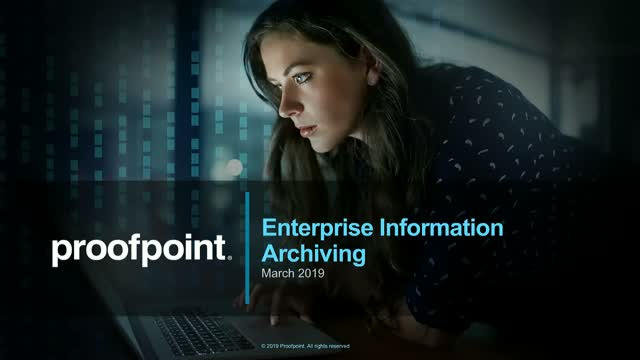 Join guest Forrester speaker Joseph Blankenship and Proofpoint for an interactive discussion about best practices around phishing and security awareness training. According to the 2019 Cyber Security Breaches Survey conducted by the UK government, the number of data breaches suffered by businesses has declined over the last twelve months since the introduction of the EU GDPR. However, is this decline because of the changing threat landscape, is it due to investments in security controls that protect our people or has GDPR truly transformed the way businesses protect the privacy of consumer data? Join Michael McGrath and Markus Grüneberg as we discuss the impact GDPR has had one year on and the new challenges and opportunities it presents as we pass into the second year. Financial services firms face some of the world’s most stringent and complex regulations. Proofpoint offers solutions that can help financial firms streamline compliance. We provide compliance and supervision solutions that provide easy capture, review, and reporting. That means complete visibility across your email, instant messages, collaboration tools, and social media. What are the best practice elements of a people-centric cybersecurity strategy, and in what order should your organization prioritize them? Proofpoint has developed a three-phase cybersecurity maturity model to help organizations go from simply protecting their email to stopping compromised cloud accounts and data loss to executing a comprehensive people-centric security program. Email fraud often doesn’t use malware attachments or malicious URLs, making it invisible to even “next-generation” email defenses. Proofpoint Email Fraud Defense provides a comprehensive solution that stops all forms of email fraud, no matter the tactic used or the person being targeted. Why is cybersecurity transformation critical right now, and what are the most effective frameworks for organizing change? Join guest Forrester speaker Jinan Budge and Proofpoint for an interactive discussion of the biggest challenges that today's CISOs face, and why a people-centric approach to security is necessary in today’s threat landscape. Join Paul MacKay, Senior Analyst at Forrester, and Nikki Cosgrove, Cybersecurity Strategist at Proofpoint, as they discuss the latest European cybersecurity trends and what you can do to guard against them. 53% of European companies have reported experiencing a data breach in the last 12 months. Companies are increasingly using cloud applications, making it easier for hackers to obtain credentials, and with email remaining the most common attack vector (over 90% of worldwide cyberattacks start with an email), it’s vital that organisations defend not just their networks, but their employees too. This webinar focuses on both Forrester European cyberattack landscape research and Proofpoint’s own threat insights. Discover what’s needed to build a cybersecurity strategy that will protect your most valuable asset- your people. Every year, FINRA and the SEC tell broker-dealers exactly what they perceive as heightened risks to the market and investors. In this way, regulators send a clear message of what to expect during exams in the coming year. As a compliance officer, this is the roadmap that sets the tone for your efforts for 2019 and beyond. Learn how Proofpoint can help you and your firm meet these and other regulatory challenges in the year ahead. Live Q & A will follow. Bad actors do not just target employee inboxes - they also target the brand itself, key employees and customers on digital channels. Social media, web domains and the deep and dark web pose areas of risk where companies are not directly in control of their communication security. Despite their value, these properties are often left unsecured against fraudulent activity. Since these are emerging threats, digital risks can be blind spots of focus for security teams. As phishing attacks continue to make global headlines, become more sophisticated and bypass traditional email security gateways; we need to empower our workforce to be aware and ready to detect them alongside the technology. Our fifth annual, 2019 State of the Phish Report explores this evolving threat landscape, offering insights drawn from tens of millions of simulated phishing attacks and our global survey of 15,000 infosec professionals over the last 12 months. The latest threat data for the Healthcare industry shows a significant shift away from attacks on infrastructure towards personalized attacks like phishing. What are the key components of a best-in-class solution for phishing simulation and training? Join this live demo to see Proofpoint Security Awareness Training in action, and learn how it addresses the most common attacks in today's Healthcare threat landscape. For this week's Interesting Threaty Byte, we bring you Super Mario and GandCrab. A new malware is making its way around the Internet and uses the popular Super Mario character from Nintendo to help spread itself. In this attack a spreadsheet contains a malicious macro that if enabled will download an image of Super Mario onto the victim’s computer. This image contains pixels that will kick off a PowerShell script that will install the ransomware GandCrab and potentially other malwares. Currently this malware only triggers when the victim’s computer is in the Italian region. It’s possible threat actors have chosen to only trigger the malware in Italy because they are testing how easily the infection will be received and spread. If the threat is met with success, the threat actors behind this malware may expand their net to ensnare more unwilling victims. For this week's Interesting Threat Byte, we bring you the LCG Kit, a new builder for malicious Microsoft Office documents. What's so fascinating about this week’s threat is it allows budding threat actors to create malicious documents of their own using this kit. LCG Kit or Linear Congruential Generator was first discovered in March of 2018 and began by creating documents that exploited certain CVE's. LCG Kit has now evolved to use macros which are popular for threat actors to use to infect a person's computer. Once infected, the threat actor can further infect the victim's computer with common malwares such as; Loki Bot, FormBook, Agent Tesla, AZORult, Revcode RAT and Quasar RAT. For this week's Interesting Threat Byte, we bring you SpeakUp Backdoor Trojan. A new trojan is targeting Linux and macOS by exploiting a Common Vulnerability and Exposures (CVE-2018-20062). First discovered on January 14th 2019, it has been targeting servers running ThinkPHP primarily in East Asia and Latin America. According to experts approximately 70,000 servers world wide are at risk and have the potential of allowing threat actors unauthorized access into these servers. Once a foothold has been achieved, threat actors can exploit further CVE’s and move to other servers located within an organizations infrastructure. Currently threat actors have installed Monero cryptocurrency miners on servers and have made about $4500 dollars, but with access to multiple infrastructure servers, this is most likely only the beginning of the damage that can be caused by this vulnerability. Recently, campaigns have been sent out claiming to have gained access to a victim’s computer and extort the user by claiming to have found pornographic images on the user’s computer as well as having images and video of the victim viewing the content. Unfortunately links in the sextortion emails tended to lead the victim to a ransomware that would lock up their computer, demanding cryptocurrency to unlock the computer. Having been successful with this approach, threat actors attempted to step up the threat by sending emails that bombs had been placed in buildings, hospitals, schools and places of employment. The threat declared if the police were called or evacuations were attempted, they would detonate the bombs. This tactic didn’t make the threat actors money, but did cause massive confusion and fear. Luckily there were no bombs found, but this latest threat demonstrates that the threat actors are always trying to come up with new and creative ways to separate us from our money. -	Finally, we equip people to respond quickly when things go wrong.